Alexandra Chando, Andrew J. West star in web-only Rockville CA. A new series from the creator of The O.C. isn't coming soon to a conventional TV screen near you. Increasingly, that's no longer the first choice of TV auteurs. Instead, Josh Schwartz's low overhead Rockville CA arrived on TheWB.com this week in four webisodes ranging from four to six minutes apiece, minus closing credits. Two new ones will be added each Tuesday through May 12th. That adds up to 20, with the total time amounting to the equivalent of a feature film. Shot on location at The Echo, a Los Angeles indie music venue, Rockville is populated with fictional young characters and real-life bands that get about 20 seconds of stage time per webisode. The Kooks, Broken West and The Duke Spirit are some of the early participants, and they're all deemed "major" by bespectacled talent scout Deb (Alexandra Chando). Her principal sparring mate is "resident music geek" Hunter (Andrew J. West), whose 'tude is relatively harmless but sometimes a little too transparently grating. "Are you always this majorly charming?" she asks him after he rags on her in the premiere webisode, subtitled "Solo Acts." Clearly they'll be falling for each other in due time, which on Rockville can't be very long. The club owner is an adult woman named Shawn (Bonnie Burroughs), who's mostly superfluous. There's also book-reading doorman/bouncer Hugh (Lester Speight), and a spaced-out club denizen known as Chambers (Ryan Hansen). Hunter dubs him "The Douche" in webisode 2. By any name, he's a way-too-cartoonish combination of Maynard G. Krebs and Screech from Saved By the Bell. All of the action takes place either inside the club or immediately outside of it. The banter is brisk but sometimes forced, with Webisode 4 falling particularly flat after an opening discourse on "stripper shoes" between Deb and her friend, Isabel (Natalie Morales). Rockville never lasts quite long enough to get wearisome, though. It's kinda cute in spots. And indie bands around Southern California no doubt are clamoring to be a part of it all, even if it's only for a short burst. But they all get a link, too. TheWB.com, which also stocks full episodes of The O.C. in its growing library, yearns to be an ahead-of-the-curve destination for what it calls "the new reality of digital entertainment consumption." Deb, Hunter and their fellow clubmates are likely to make the site hotter than it's ever been. Right now that's not so hot. But stay tuned -- in an antiquated manner of speaking. 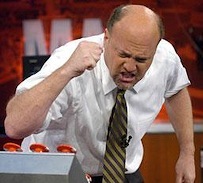 CNBC's excitable Rick Santelli and Jim Cramer flank Jon Stewart. Credit the co-parent of hulu.com with being able to take a punch -- and then another one. I three-quarters expected hulu, owned by NBC Universal and News Corporation (Fox's parent company), to omit Jon Stewart's devastating Daily Show dissections of CNBC blowhards Rick Santelli and Jim Cramer. After all, Stewart makes both of them -- and their all-business network -- look like bear's asses. And that's not always good for business. On the contrary, though, hulu carries both of these clips in its regular Daily Show section. A 30-second commercial paves the way, which may be the saving grace. But it's still a praiseworthy decision on NBC Universal's part, even if the corporation triggered Stewart's rants by allowing Santelli to belatedly back out of a scheduled Daily Show appearance shortly after he was targeted as a know-nothing by White House press secretary Robert Gibbs. Here's video of the second and shorter Stewart bit, in which he zeroes in on Cramer and leaves him bent, spindled and mutilated. Mmm mmm good.